Chickpeas cooked with Cumin and Dill, a traditional Greek salad. With Greek olive oil. Ready to serve. No preservatives. Gluten & cholesterol free. Suitable for vegetarians. Great traditions, fine taste, to share! Glutten-free, non-GMO, No preservatites, No additives! Totally vegetarian and great for Lent! Meze is a small dish, hot or cold, served in the Mediterranean region with an aperitif or as a light meal. 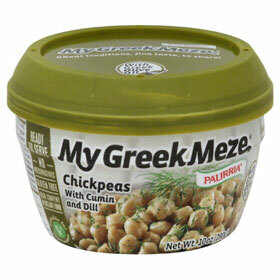 Meze complements and enhances the taste of the drink and provides the backdrop for a social gathering. Meze is more than just a dish; it is a sharable eating experience. Palirria combines a 50 years old cooking experience with the finest natural ingredients and olive oil to prepare the most delicious meze dishes for you. You can savor this authentic Greek dish by adding on top freshly squeezed lemon.